When the guide opens the door, a blast of cool air will rustle your hair, and you'll understand why the locals built a hut over the Buca del Vento, or Wind Hole, as they called it, and used it to refrigerate their produce until World War II. They realized, of course, that all that wind couldn't be coming from just a tiny fissure, and at the turn of the century persuaded a four year old girl to crawl into it. She emerged terrified by the open space she'd found. In 1932 a group of Florentine speleologists excavated the fissure, finding a few cave bear bones mixed with the sediments, and got 70 meters before they discovered an underground lake. 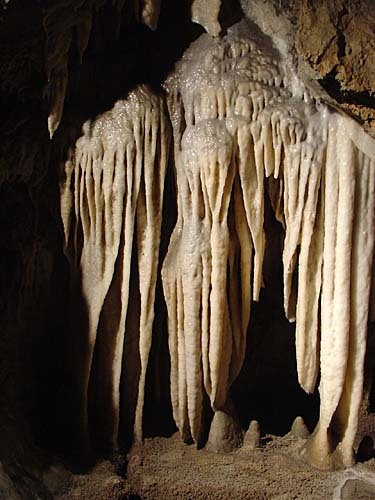 When others returned during the drought of 1962, the lake was dry, and they entered a bizarre world of stalactites and fancifully shaped calcite deposits known as concretions, banded calcite curtains, and shafts that either sink into the ground or disappear into the shadows. By now more than four km of tunnels have been explored, and a kilometer is open to the public. As you walk down the modern passageway that opens above the lake, you will begin to hear the steady dripping of water that will accompany you throughout your visit. There are three tours, which take 1, 2, and 3 hours to complete (plus a fourth, which is called "adventuresome," that I have not done). 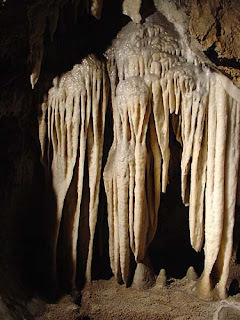 The first is essentially horizontal, to a series of halls whose walls are lined with concretions, some resembling eerie creatures from the deeps, and from whose ceilings hang stalactites and curtains of banded calcite you might wish you had in your bedroom. The second itinerary goes further, down stairs so steep they almost seem like ladders, into a shaft discovered by a speleologist who tossed a rock into an opening and heard a long series of impacts. You leave the concretions behind and enter a shadowy world where even whispers echo, tiny water droplets dance in the lights, and everything is coated by the silt left behind by the waters that flood the tunnels during the rainy season. After viewing the Acheron, a stream that disappears into a cobble patch, you will return to the hall with the curtains via tunnels whose mud encrusted walls look like wooded hills. The third itinerary branches off from the first, past a wall that looks like a mudslide frozen as it rumbled down slope, to the shaft of an underground water fall known as the Well of Infinity. The stairs to the lip are cramped, and you get rained on, but it's all worth it to watch the water spatter into the maw of the pit from above. The itinerary then merges with the second. 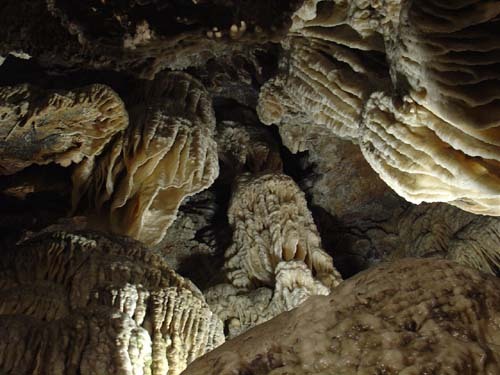 The Grotta del Vento is located in Tuscany; to reach it you will have to drive: Take the road from Lucca to Castelnuovo Garfagnana, and turn off for Fornovolasco at Gallicano. Unless you are physically unable to tackle several hundred stairs over a period of three hours, you should take the third tour. It runs twice daily, at 10:00 and at 2:00 (20 Euros / person), and you should make reservations, especially in August (write to info@grottadelvento.com). Also, since the last ten km of the road are tortuous, give yourself plenty of time t o get there. A second bit of advice: The cave's temperature is a constant 50 degrees F (about 10 C). If you go in the summer, bring long pants and a sweater (I changed in the parking lot, and was not the only one doing so). And proper footwear. Not sandals. If you go in the morning, there's a simple trattoria a couple of km before the cave mouth that's not bad. This year Nebbiolo Prima began with the 2008 Roero, followed by the 2008 Barbaresco and the 2007 Barolo; there were also a few Barbaresco Riservas, and on the last day a number of 2005 Barolo Riserva wines. The afternoons were structured somewhat differently, with Monday afternoon dedicated to the 2001 vintage, a retrospective if you will, Tuesday and Thursday dedicated to winery visits and tastings, Wednesday free (and I did take advantage of that), and Friday an optional visit to Diano and Dogliani to taste Dolcetto di Diano and Dolcetto di Dogliani/Dogliani. A full week, but both pleasant and profitable, and I learned quite a bit during the afternoon sessions, while the mornings were profitable as always. To begin, a couple of words on the vintage. With Barolo we had the 2007 vintage, which is more approachable than the 2006 we tasted last year, with many of the wines richer, more opulent, and readier to drink. This said, as vintages go it's not as good as the 2006, and though the bottles will work better in the short term (3-5 years and perhaps a little longer) the 2006 has, I think, much better potential for long-term ageing. This is not a bad thing; I found many 2007 wines that will be quite pleasant with foods (not as much in the way of meditation wines), and vintages that mature sooner are necessary, because they give us something to enjoy while we await the vintages that need time. A final practical point: I took a terrific volume of notes in the course of the five days of Nebbiolo Prima. To put everything up at once would be unthinkable, and putting up all of the Barolo notes together would be awkward. So I will be posting Roero, Barbaresco, and then Barolo by Comune, in the space of several posts. The wines are listed in the order they were poured, which within the Communes is by vineyard. Deep almandine with black reflections and almandine rim. The bouquet is muted, though swishing brings up some berry fruit and slight rosa canina mingled with some balsamic notes and slight hints of sweetness. On the palate it's full and smooth, with fairly powerful slightly balsamic berry fruit supported by balsam laced acidity and by smooth sweet tannins that flow into a fairly long tannic finish with a balsamic underpinning and lasting warmth. I'd have liked a little more brightness to the acidity, which is a touch settled. This said, it is quite approachable and pleasingly smooth and rich. Deep almandine with black reflections and almandine rim. The bouquet is quite young, with deft rosa canina mingled with spice and slight sweet accents, and also with pleasant greenish leaf tobacco accents. Nice depth, though it's very young. On the palate it's elegant, with fairly rich cherry fruit supported by deft berry fruit acidity and smooth steely tannins that flow into a fairly long rather tannic finish. It's elegant in an approachable key, and though I'm not sure how long lived it will be quite pleasant in the short term (less than a decade) and add considerably to a meal built around a steak or a roast. Deep almandine with black reflections and almandine rim. The bouquet is fairly intense, with balsam-laced rosa canina and spice mingled with Moroccan leather and some pungent spice. On the palate it's ample, with moderately intense rather mineral fruit supported by peppery spice and tannins that are rather peppery, and flow into a clean peppery finish. It's approachable, but a touch settled, and I found myself wishing for brighter acidity than it displays. This said, it's very young, and needs time to come together and develop. Deep black almandine with black reflections and almandine rim. The bouquet is powerful, with berry fruit laced with balsamic notes and animal tang with a fair amount of alcohol as well; there's a dusky brooding quality to it that is in part youth. On the palate it's ample and rich, with powerful cherry fruit supported by moderately intense spicy berry fruit acidity that has some sweetness to it, and by tannins that are smooth, though they do have slight youthful peppery accents, and it flows into a fairly balsamic finish that's quite long. Traditional, and rather graceful in this key; if you like the style you will enjoy it considerably. I would give it a year to come together, and expect it to age well for at least a decade, perhaps longer. Almandine with black reflections and almandine rim paling to orange. The bouquet is intense, with ripe berry fruit laced with rosa canina and some leaf tobacco, and sweetish balsamic accents too that provide depth. On the palate it's full, and fairly sweet, with slightly jammy berry fruit supported by deft balsam-laced berry fruit acidity and by smooth sweet tannins that have a certain warmth to them and flow into a fairly long clean balsam-laced plum cherry finish. It's quite young, and quite approachable, and will drink now with stews or roasts, though it also has the legs with which to age nicely for a decade or more, at least. Deep black almandine with black reflections and almandine rim. The bouquet is fairly intense, with balsamic notes and spice supported by leaf tobacco and some berry fruit; it's very young, but displays pleasing complexity. On the palate it's full, with bright rich cherry fruit supported by deft slightly savory berry fruit acidity, and by tannins that are warm and savory, with slight bitter graphite accents, and flow into a clean fresh tannic finish. Graceful, and though one could drink it now with a steak or roast, it will reward those who have the patience to give it 3-5 years, and are well for a decade more, at least. Almandine with brownish black reflections and almandine rim. The bouquet is fairly rich, with rosa canina and some leather supported by leaf tobacco and spice, and delicate underlying berry fruit, with mentholated spice as well. On the palate it's bright, with fairly rich berry fruit supported by sour berry fruit acidity and some underbrush, and by tannins that are warm and already fairly smooth, with a dusky burr, and flow into lasting warmth. Pleasant in a fairly direct key and quite approachable despite its youth, and will also age nicely. Deep ruby with black reflections and slight orange in the rim. The bouquet is metallic, with dusky bitter notes and some spice, and also some underlying berry fruit supported by quite a bit of alcohol. On the palate it's straight forward, with ripe rich cherry fruit supported by brisk cherry and forest berry fruit acidity, and by muscular tannins that have a youthful burr, and flow into a fairly bright sour cherry finish. It's like a well-muscled teen athlete, up front and vigorous, and is pleasing in its directness. One doesn't usually say a Barolo is a wine to set out and drink, but that's what will happen if you set this out with a well-marbled porterhouse cut. Almandine with brownish black reflections and some almandine in the rim. The bouquet is fairly intense, with fairly rich berry fruit supported by mentholated accents and spice, and some berry fruit jam as well, and underlying cedar and leaf tobacco. Vigorous. On the palate it's fairly rich, with bright cherry and forest berry fruit supported by deft sour berry fruit acidity and by tannins that are fairly smooth, and have slight savory notes to them; they're not velvety yet but could go that route. It's not tremendously complex, but is pleasant in a rather muscular key, and will age nicely for many years. Black almandine with black reflections and almandine rim. The bouquet is fairly intense, and spicy, with savory berry fruit and some cedar mingled with Moroccan leather and some mentholated accents. On the palate it's fairly direct and quite smooth, with moderately intense rather bitter berry fruit supported more by minerality than acidity, and by ample very smooth tannins that flow into a fairly quick savory finish. It lacks oomph and complexity, and to be honest I would expect more from a Barolo. Almandine with brownish black reflections and almandine rim. The bouquet is moderately intense and rather chemical at the outset, though this blows off to reveal spicy notes and green leather with some savory accents and underlying leaf tobacco. Not much fruit, but that's not uncommon in Nebbiolo. On the palate it's full, with leafy minerality supported by pleasant sour berry fruit acidity, and by tannins that are rather splintery and flow into a fairly long mineral finish with underlying sour berry fruit acidity. Fairly direct, but will drink quite well with succulent red meats. I'd have liked a little more fruit to complement the minerality. Almandine with black reflections and almandine rim. The bouquet is powerful and quite fresh, with mentholated jammy berry fruit with some fresh cut ripe yellow peach accents supported by pleasant spice; it's very young, and has a pleasant cheekiness to it, and as it opens the menthol increases and some leaf tobacco also emerges. On the palate it's rich, with bright berry fruit supported by sour berry fruit acidity and graphite bitterness, and by tannins that are fairly smooth, and ample, though they do have bitter accents as well. It's fairly straightforward but has nice fruit and power, and will drink quite well with foods, and also age well for many years. Deep almandine with black reflections and some orange in the rim. The bouquet is smoky and penetrating, with hardwood ash supporting minerality and slight berry fruit, though what really comes though now is the penetrating smoke. On the palate it's ample, with moderate sour berry fruit supported by sour berry fruit acidity and tannins that have a warm splintery burr, and flow into a rather splintery tannic finish. It's young, and needs a year to come together; this said it's fairly direct and I might have liked a little more complexity. Deep almandine with black reflections and almandine paling to orange in the rim. The bouquet is bright, with slightly jammy berry fruit supported by slight brambly spice, some white pepper, and as it opens chalk and cedar. On the palate it's full, with moderately intense rather liquid jammy plum cherry fruit supported more by minerality than acidity, and by tannins that are rather splintery and flow into a palate-drying tannic finish with some plum accents. The tannins may smooth in with time, but at present they are simply too dry for me. Almandine with black reflections and orange rim; it looks a little older than it is. The bouquet is fairly intense with greenish vegetal accents and quite a bit of alcohol supported by nose tingling spice and green leather, and -- gradually and grudgingly -- some berry fruit. On the palate it's ample and languid, with fairly rich plum cherry fruit that has a degree of sweetness to it that's also due to alcohol, and is supported by some plum acidity and fairly smooth ample tannins. The palate is more ahead of the nose in a quite ripe key, and I would give it a couple of years at least a year. If you like ripe but not soft wines you'll enjoy it; if you prefer wines that are more towards cherry and berry fruit you'll like it less. But it does have a cheeky appeal. Deep black almandine with black reflections and cherry rim. The bouquet is muted, with some berry fruit and slight mentholated spice supported by slight acidity; it's still coming together. On the palate it's bright, with lively cherry and forest berry fruit supported by berry fruit acidity and by tannins that have hints of Moroccan leather and leaf tobacco to them, and flow into a dry tannic finish with quite a bit of alcohol to tingle the tongue. It needs another year to come together, at which point it will be pleasant in a fairly direct, up front key. Deep black almandine with black reflections and pale rim. The bouquet is fairly rich, with berry fruit supported by spice and slight cedar mingled with greenish vegetal notes and some leaf tobacco, and also a fair amount of alcohol. Very young and still going in several directions at once, but promising. On the palate it's full and smooth, with fairly powerful ripe cherry plum fruit supported by some jammy berry fruit accents and moderate mineral acidity that has a greenish cast, and tannins that are ample and have a certain dusky bitterness to them. Pleasant in a slightly voluptuous rather ripe key, and will drink well with succulent meats, including drier meats such as pot roasts, and will also age nicely for a decade or more. Almandine with black reflections and almandine rim paling overtones orange. The bouquet is fairly intense, with delicate rosa canina and leaf tobacco supported by some minerality and underlying berry fruit. Pleasing elegance in a fairly traditional key, and though it is quite young it has a lot to say. On the palate it's ample and smooth, with rich sour cherry fruit supported by berry fruit acidity and by tannins that have a smooth sweet burr, and flow into a fairly long sour cherry finish. It's quite young, but graceful, and will work very well with foods now, and also age well for a decade at least. Deep almandine with brownish black reflections and leathery orange in the rim. The bouquet is fairly intense, with leather and leaf tobacco more than fruit, smoky bitterness, and as it opens greenish vegetal accents too. On the palate it's ample with moderate rather soft fruit -- mostly plum though it's fairly generic -- supported by minerality and tannins that while languid and broad also have a splintery burr, and flow into a fairly sweet cherry plum finish. It's a bit lax, with the tannins that are dry, and I'd have liked more acidity and better tannic definition. Deep black almandine with black reflections and almandine rim. The bouquet is fairly intense, in a sweetish cast, with menthol and rosa canina mingled with fairly bright mineral acidity, leaf tobacco, and spice. On the palate it's ample and soft, with ripe slightly sour cherry fruit supported by berry fruit acidity and menthol-laced tannins that flow into a long warm finish with spicy mentholated notes. It's rather languid and quite approachable, not to say surprisingly mature for a young Barolo. If you prefer tighter more acidic wines it won't work as well for you, but if you like ample riper wines you will enjoy it. Very much a child of the vintage. Deep black almandine with black reflections and almandine rim. The bouquet is rich, with ripe berry fruit supported by greenish vegetal accents and some greenish yellow peaches with slight leaf tobacco as well. On the palate it's ample, with bright cherry fruit supported by sour cherry acidity and tannins that have a youthful splintery burr, and flow into a fresh sour berry fruit finish. Quick to write but harmonious in a fairly direct cheeky key that brings a smiling tomboy to mind, and will drink well with foods, red meats in particular, and also age nicely for a number of years. Deep black almandine with black reflections and almandine rim. The bouquet is is fairly intense, with smoky peppery accents mingled with a fair amount of menthol and some alcohol, supported by rosa canina and leaf tobacco, and slight sweetness. On the palate it's ample and smooth, with moderately intense berry fruit supported by mineral acidity and tannins that have a splintery burr; it's not as full as I might have liked, and as the fruit fades the tannins stand around wondering what to do. Almandine with black reflections and brownish orange rim. The bouquet is mature, with balsamic accents mingled with some warmth and spice, and a fair amount of alcohol. Not much fruit. On the palate it's brighter than the nose suggests, with fairly rich slightly sweet sour cherry fruit supported by moderate acidity and by tannins that have a greenish splintery burr, and flow into a rather dry tannic finish. It needs a year for the nose to develop, and perhaps two for the tannins to smooth, at which point it will be middle of the road in key. I found myself wishing for a little more richness to the fruit. Deep black almandine with black reflections and almandine rim. The bouquet is moderately intense, with minerality and leaf tobacco; the combination is quick to write but harmonious. On the palate it's bright, with lively sour cherry fruit that has some ripe berry fruit accents, supported by berry fruit acidity and by fairly rich tannins that have a mentholated burr and flow into a fairly long sour cherry finish. Pleasant, with verve and vigor, and will work very well with grilled meats or roasts now, while it also has the capacity to age well for a number of years, becoming lacy with time. Deep black cherry ruby with black reflections and pale pinkish-orange rim. It's a bit redder than some. The bouquet is fresh, with rich jammy berry fruit supported by some mentholated notes and some leaf tobacco. On the palate it's bright, with rich sour cherry fruit supported by fairly savory minerality and bright berry fruit acidity, and by tannins that have a youthful peppery burr and flow into a bright peppery sour berry fruit finish with lasting warmth. It's quite lively, and very approachable; one could drink it with a steak already, though it will reward those with the patience to give it a couple of years to develop. Big, fresh, and forward. Fairly deep black almandine with black reflections and almandine rim. The bouquet is moderately intense and mineral with some smoke, but not much fruit; there are hints of cocoa and cold coffee however. On the palate it's brighter than the nose suggests, though rather languid, with fairly rich cherry fruit supported by sour cherry raspberry acidity, and by tannins that are smooth and rather dry, flowing into a clean dry tannic finish. There's a sinuosity to it -- soft richness of fruit and tannin -- which isn't standard for Barolo but is fairly typical of this vintage, and makes it quite approachable even in youth. It will drink well with grilled meats or roasts now, and will also age nicely for a decade or more. Deep black almandine with black reflections and almandine rim. The bouquet is penetrating, with acidity and minerality laced with leaf tobacco and some cedar, and a fair amount of spice, with some hints of sweetness too. Rich, and fairly mature. On the palate it's full and rather languid, with cherry plum fruit supported by moderately intense acidity and by tannins that are quite blocky and lay a splintery burr over the tongue and flow into a fairly long warm peppery finish. It's fairly ripe, and despite the languidity of the fruit quite young from a tannic standpoint, needing at least a couple of years for them to fold in. An interesting combination of ripeness and tannic brashness; it's particular and if you like the style you will enjoy it -- in a few years -- but you have to like the style. Deep black almandine with black reflections and almandine rim. The bouquet is intense, with shellac and cedar mingled with petroleum at first swish, and more of the same with the second. Lots of oak. On the palate it's ripe, and quite smooth, with fairly rich cherry plum fruit supported by deft slightly dusky berry fruit acidity and by smooth sweet savory tannins that have a clean cedar overlay and flow into a long warm cherry plum fruit finish with savory tannic underpinning. Quite graceful, in a rich international key, and though the fruit is ripe it's not overripe and has acidity for direction; if you like the international style you will enjoy it very much, and even crusty traditionalists will find things to think about. Deep black almandine with black reflections and almandine rim paling overtones orange. The bouquet is intense and fresh, with violets and peppery spice supported by some balsamic notes and a fair amount of alcohol; it's going in several directions at once and with the second sniff seems somewhat disjointed. On the palate it's full, with fairly bright berry fruit that is however quite short, giving way to dry tannins that sit there by themselves, wondering what to do next. It may come together in a couple of years, but I'd have liked more harmony today -- there isn't much. Deep black almandine with black reflections and almandine rim. The bouquet is fairly intense, and greenish, with alcohol and cedar and some menthol, but not much in the way of fruit. On the palate it's ample with fairly ripe berry fruit supported by sweetish plum accents and tannins that are very dry and splintery, and flow into a dry splintery finish. It's like someone wandering around in boxer shorts -- not ready for polite society, and won't be for at least a couple of years; the tannins are very aggressive now and shut out the fruit. Deep black almandine with black reflections and almandine rim. The bouquet is moderately intense and greenish, with spicy savory notes and wood smoke, but not much fruit. Pungency, and greenishness, but not fruit. On the palate it's splintery, with sour berry fruit that is overwhelmed by tannins before it has time to do much more than raise a hand, and the finish continues at length. In college we talked about angry young men, and this is an angry young wine. Deep almandine with black reflections and almandine rim paling to white. The bouquet is fairly rich, in a funky key, with balsamic accents and some sea salt mingled with wet stable straw and some plum cherry fruit. On the palate it's ample, and softer than I expected, with moderately intense cherry plum fruit supported by slight balsam-laced acidity and by tannins that are ample and smooth, and flow into a rather soft balsamic finish. It feels as if the ripening got away from them, and though the tannins are sweet and ripe the fruit is overripe and acidity has fallen off. Deep black almandine with black reflections; it's one of the darkest wines poured so far. The bouquet is dusky, with savory notes and spice supporting some berry fruit; there's also some rosa canina, and a certain sweetness to it. On the palate it's bright, with rich red berry fruit supported by lively sour berry fruit acidity and tannins that have a youthful splinteriness to them, and flow into a fairly bright sour berry fruit finish. It's quite young in a rather muscular key, but approachable, and will drink well with red meats in the short term, while aging nicely over longer periods. If you like the style, which revolves more around power than finesse -- it's more a wine for red meats than meditation -- you will enjoy it, and it will age nicely for at least a decade. Deep black almandine with black reflections and almandine rim paling to white. The bouquet is fairly intense, with spice and savory accents mingled with leaf tobacco and warmth but not much fruit. On the palate it's ample and quite smooth with cherry plum fruit supported more by dusky bitterness than acidity, and by tannins that are ample, soft and smooth, and flow into a fairly long plum finish with peppery accents. Pleasant if you like the style, but you have to like bigger softer very ripe wines. If you prefer tighter wines with more acidity and verve it won't work as well for you. Deep black almandine with black reflections and almandine rim. The bouquet is moderately intense, with spice and some greenish accents shot through with warmth and some greenish vegetal accents that emerge with swishing. On the palate it's brighter than I expected from the nose, with fairly rich sour cherry fruit supported by berry fruit acidity and dusky leaf tobacco bitterness, while the tannins are ample and rather blocky, but display some hints of velvet. It's very young, with the palate a little further along than the nose but neither really presentable. I would give it a couple of years to come together, and expect it to age nicely in a traditional key. Black almandine with black reflections and almandine in the rim. The bouquet is oddly metallic, with some sweetness and plum cherry fruit, but what really comes through it peppery hot iron. On the palate it's ripe, with cherry plum fruit supported by savory warmth and tannins that are ample and fairly smooth, though they do have some splinters to them. I'd have liked more brightness and richness to the fruit, which is a little too ripe and doesn't really stand up to the tannins. Deep black almandine with black reflections. The bouquet is powerful, and fairly balsamic, with warmth and some alcohol, and some spice, with slight greenish vegetal accents that add depth, and some underlying cedar. On the palate it's fairly bright, with moderately intense berry fruit supported by some acidity, and by tannins that have a cedary burr and flow into a peppery tannic finish with warm sour berry fruit underpinning. It needs another year for the tannins to fold in, and is fairly direct; I'd have liked more richness to the fruit and less cedar in the tannins, which are angrier than the fruit warrants. Black almandine with black reflections and almandine rim. The bouquet is fairly intense, with jammy berry fruit supported by mentholated accents and spice with some underlying leaf tobacco as well. Nice balance in a fairly forward key. On the palate it's quite ripe and rather soft, with smooth sweetish cherry plum fruit supported by moderately intense mineral berry fruit acidity, and by ample sweet smooth tannins that flow into a fairly long fruit laced finish with some savory accents, and deft underlying tannins that have some balsamic accents. It's soft, but not overripe, and if you like the style you will enjoy it, though it is soft for a Barolo. It may do interesting things over the next 5-8 years, though I doubt it will be really long lived. Almandine with black reflections and almandine rim paling to white. The bouquet is fairly intense, with balsamic plum fruit supported by slight stable straw and summer sun low in the sky -- that's what the aroma brings to mind -- with greenish peppery accents as well and some nose tingling acidity that verges on the pungent. On the palate it's ample and ripe, with rich soft plum cherry fruit supported by smooth sweet tannins that have a slight glancing youthful quality to them, and by moderate berry fruit acidity that flows into a fairly long bright berry fruit finish with underlying sour berry fruit acidity. It's ripe and fairly soft, but not overripe, and comes across as being from a hot vintage though the acidity is maintained; if you like the style -- a big soft not too ripe wine -- you will enjoy it because it does display a certain grace, but you have to like the style. If you prefer wines that are tighter and more vigorous, it won't work as well for you. Deep black almandine with black reflections and almandine rim. The bouquet is fairly intense, with ripe berry fruit supported by spice and greenish accents, and by some leaf tobacco and slight balsamic notes, with alcohol providing support from underneath. On the palate it's ample and quite ripe, with cherry plum fruit supported by warm savory minerality and tannins that have a spicy burr and flow into a long warm tannic finish. It's pleasant, and fairly zesty in a big ripe but not overripe key, and if you like the style will drink nicely in the short term with drier meats, though I wouldn't age it for too long. Deep black almandine with black reflections and ruby in the rim; it's one of the darker wines poured today. On the palate it's fairly intense, with some berry fruit supported by cedar and leaf tobacco and some mentholated spice; nice depth in a fairly international key. On the palate it's bright, with fairly rich cherry fruit supported by berry fruit acidity and smooth sweet tannins that have a slight burr, and flow into a clean sour berry fruit finish with slight cedary accents. It's up front and direct in a fairly muscular key, and will drink quite well with succulent roasts or stews. If you're looking for more complexity I'm not sure you'll find it here, but it will work very well with foods, and that's important in a wine too. Deep black almandine with black reflections and almandine rim. The bouquet is fairly intense, with gum Arabic and spice supported by a fair amount of alcohol and some leaf tobacco; there are also slight vegetal accents. On the palate it's ample and quite ripe, with cherry plum fruit supported by mineral acidity and by ample soft tannins that have a slight dusky burr and flow into a fairly long slightly sour finish with berry fruit and balsamic accents and a very dry tannic underpinning. It's ample and on the softer side of the spectrum; I'd have liked a little more brightness to the fruit, which the tannins eclipsed on the second sip. This will likely improve with time, but I must score what I taste. Deep black almandine with black reflections and almandine rim. The bouquet is intense, with petroleum and greenish accents mingled with quite a bit of sea salt and some barnyard tang; it comes across as aggressive. On the palate it's surprisingly languid, with leathery berry fruit supported by warm balsam-laced tannins and slight balsamic acidity that flow into a fairly long finish with berry fruit and leaf tobacco. Much older in style on the palate than the nose in its present stage would suggest, and I would give the wine a couple of years to get its bearings, because it may do interesting things in a ripe traditional key. If you prefer brighter more fruit forward wines it won't work as well for you. Boroli Cerequio Barolo DOCG 2007 Almandine with black reflections and almandine rim. The bouquet is fairly intense, with mineral laced berry fruit supported by some balsamic accents and pleasant spice, with some sour berry fruit acidity as well. On the palate it's ample and full, with fairly bright sour cherry fruit supported by berry fruit acidity and by tannins that are warm and full, and fairly smooth, and flow into a clean savory finish with bright berry fruit and tannins that are rather blocky. It's still very young, but approachable, and if you like the style, which is more towards berry fruit (as opposed to plum) but not really tight, you will enjoy it; it will work well with stews or roasts. Pale almandine with black reflections and almandine rim. The bouquet is fairly intense, with rosa canina and leaf tobacco supporting some red berry fruit and slight smoky spice. Nice depth and harmony, though still quite young. On the palate it's full, with elegant cherry fruit supported by deft berry fruit acidity and by tannins that are smooth and sweet, with slight leaf tobacco accents, and flow into a long warm fairly bright cherry finish. Graceful, and though one could drink it now with a steak or roast, it will also age quite nicely for many years. If you are more traditionally minded you will enjoy it considerably, and modernists will find things to think about too. Deep almandine with black reflections and almandine rim. The bouquet is fairly bright, with lively sour berry fruit supported by peppery spice and some balsamic accents, with some leaf tobacco and sea salt as well, and slight hints of rosa canina. Coming together, but nice depth. On the palate it's ample, with fairly rich leathery sour berry fruit supported by moderately intense prune and mineral acidity and by tannins that are smooth and ample; it's fairly graceful, though a little more delicate than I might have expected -- a touch more verve would have been nice. The finish is savory and fairly long. Almandine with black almandine reflections and almandine rim. The bouquet is fairly intense, with savory notes and some greenish yellow peach with underlying shellac, and slight berry fruit. On the palate it's ample and soft, with moderately intense rather generic fruit supported by minerality more than acidity, and tannins that are smooth and rather glancing. I'd have liked more richness and brightness to the fruit, which gives way to the tannins, which don't do the same job when it comes to leading a wine. Deep almandine with black reflections and almandine rim. The bouquet is fairly intense, with leaf tobacco and spice mingled with rosa canina and slight sweetness; it's quite young but displays nice depth. On the palate it's ample and smooth, with fairly rich sour cherry fruit supported by some sour berry fruit acidity and by ample smooth tannins that have a slight burr, and flow into a clean fresh berry fruit finish. The tannins are bit lax and it's not really tight, and this is an effect of the vintage; if you like ample soft not overripe wines you will like it, and even if you prefer more verve you will find things to ponder, especially in the nose. A delicate expression of the vintage in a soft but fairly traditional key, and it could become quite interesting with time. Almandine with black reflections and almandine rim. The bouquet is fairly rich, with lively sour cherry fruit laced with floral accents and greenish vegetal spice, and also some leaf tobacco and slight green leather. On the palate it's bright, with lively sour cherry fruit supported by bright berry fruit acidity and tannins that are fairly smooth, though they do display a fairly bright burr, and flow into a long warm tannic finish with sour berry fruit underpinning. Pleasant in a rather bracing key, and needs a year at least to come together; the tannins are fairly aggressive and will likely remain so, but it will work very well with foods when it has its bearings. Pale almandine with black reflections and almandine rim. The bouquet is intense, with some petroleum and spice mingled with greenish vegetal accents that bring to mind unripe yellow peach, and a fair amount of spice; there's also some cedar. On the palate it's bright, with lively sour berry fruit supported by tannins that are peppery and flow into a warm peppery tannic finish with some alcohol and sour berry fruit with some of the same peaches present in the nose, that settles into tannic dryness. It needs a year for the tannins to fold in, at which point it will be middle of the road in key. Deep black almandine with black reflections and almandine rim. The bouquet is moderately intense, with a fair amount of cedar and some greenish brambly notes supported by alcohol; there's not much fruit. On the palate it's full, with fairly rich berry fruit supported by mineral more than fruit driven acidity, and by tannins that are rather peppery and flow into a warm rather bitter finish with considerable dry tannic overlay. It needs at least a year for the tannins to fold in, and two will likely be better; at present it's really not ready for polite society. Deep almandine with black reflections and almandine in the rim. The bouquet is powerful, with quite a bit of cedar and some cold coffee, with greenish accents and spice as well. On the palate it's fairly rich, with moderate berry fruit supported by cedar laced tannins and some mineral acidity that flow into a fairly long cedary finish. A great deal of oak, too much for me. Deep black almandine with black reflections and almandine rim. The bouquet is intense, with berry fruit supported by some cedar and peppery spice, and also by a fair amount of alcohol. On the palate it's bright, with fairly rich cherry fruit supported by sour berry fruit acidity and tannins that have some graphite shaving bitterness, and flow into a clean peppery tannic finish. The fruit of the palate is further along than the nose, which is in mid stride, though the tannins need a year at least to smooth over, and it would benefit from at least a couple of years. It will age well for many years thereafter. Deep almandine with black reflections and almandine rim. The bouquet is rustic, with balsamic accents and wet stable straw mingled with some greenish notes. On the palate it's bright, however, with lively sour cherry fruit whose acidity gives it a sunny cast supported by tannins that are smooth and sweet, and flow into a fairly long berry fruit finish with balsamic overtones and hints of barnyard tang with underlying mentholated spice. If you like the style you will enjoy it, because it has a fresh and invigorating brightness, and also considerable aging capacity, and will become gracefully lacy with time. Almandine with black reflections and almandine rim. The bouquet is fairly intense, with berry fruit supported by greenish accents and leathery spice, and by a fair amount of alcohol. Quite young and still coming together. On the palate it's fairly rich, and rather languid, with ample soft berry fruit supported by mineral acidity and by tannins that are very dry and cast a veneer over the tongue; they're quite aggressive and overshadow the fruit completely. Too aggressive for me, and while it's true that they will fold in with time they'd have to fold in quite a bit. Deep almandine with black reflections and almandine rim paling to orange. The bouquet is spicy, with quite a bit of cedar and some greenish spice, and some leaf tobacco, though what really comes out now is the cedar. On the palate it's full, with fairly rich plum cherry fruit supported by brown sugar sweetness and slight acidity, and by tannins that are ample and quite smooth, and flow into a fairly long finish that has some sour berry fruit acidity for direction and lasting warmth. It's quite ripe, in a rather languid key, but not really soft -- the fruit has prunes, but the acidity and tannins are there to keep it from settling, and the finish is bright. It's not what I really think of in terms of a Barolo -- the fruit is quite ripe and I prefer tighter tannins -- but it works well, and will drink nicely with drier meats and also with meat dishes that have some sweetness to them, say roast rabbit with prunes. Deep black almandine with black reflections and almandine rim. The bouquet is fairly rich with greenish plum fruit accents and some spice supported by spice and some dusky cedar. Quite ripe, and bright in this context. On the palate it's ample and quite ripe, with cherry plum fruit supported by fairly sweet berry fruit acidity and by ample tannins that have a slight splintery burr and flow into a clean dusky finish with some leaf tobacco accents mingled into mineral acidity and slight tannic notes that emerge as the fruit fades. It's ample and ripe, but not overripe, and if you like bigger softer wines you will enjoy it. If you instead prefer tighter wines that are better defined it will work less well for you. Deep black almandine with black reflections and almandine rim with some orange. Darker than most of the wines poured today. The bouquet is intense with penetrating, quite nose-tingling cedar-laced acidity and greenish spice; the combination is powerful and covers whatever other nuances there may be. On the palate it's ample, with fairly rich cherry plum fruit supported by moderate mineral acidity and some bitterness, and by tannins that are ample and fairly dry, and flow into a peppery finish with leaf tobacco-laced berry fruit. It's very young, and the nose gives an impression of being in a funk at the moment; I have a feeling that it will gain in complexity over the next couple of years, and the wine will be worth waiting for. This said, stylistically it is ample and soft, and will only really work for you if you like this kind of wine. If you prefer tighter more closely bound Barolo, it will work less well for you. Almandine with black reflections and almandine rim. The bouquet is fairly intense, with leaf tobacco and sweetish spice mingled with rosa canina and some berry fruit, and underlying cedar with hints of hardwood ash; it's quite fresh and quite young, and though clearly in mid stride inviting. On the palate it's full and bright, with fairly intense cherry fruit supported by dusky bitter graphite shaving laced acidity and tannins that have a savory peppery burr and flow into a fairly long savory tannic finish. Pleasant in youth, and though the acidity isn't really bright it does have a certain peppery verve to it. Dusky almandine with black reflections and almandine rim. The bouquet is fairly rich, with strong vegetal notes supported by some cedary notes and quite a bit of alcohol; there's also some leaf tobacco and green spice. Not much fruit. On the palate it's ample, with fairly rich cherry fruit supported by moderate acidity and tannins that are ample and soft, and flow into a rather peppery finish. It's quite well along, and very approachable in a fairly large soft but not overripe key. Deep almandine with black reflections and almandine rim paling to Moroccan leather orange. The bouquet is powerful, with berry fruit mingled with scalded milk and hints of almond milk, which is a wood-fruit interaction, and quite a bit of milky cedar. Lots of oak. On the palate it's full, with fairly rich plum prune fruit that surrenders to a wave of peppery cedar laced spice that continues into a long cedar laced finish. Hugely oaky, and the oak overshadows the fruit completely; while oak does fold in with time I doubt it will successfully here. Deep black almandine with black reflections and almandine rim. The bouquet is fairly rich, in a greenish vegetal key with spice and some peppery accents, with quite a bit of cedar too. On the palate it's rather languid, with moderately rich sour cherry fruit supported by slight minerality and to a greater degree by tannins that have a peppery burr and flow into a warm tannic finish. It's in flux, with the components going in several directions, and needs a year or perhaps two to come together and get its bearings. Deep black almandine with black reflections and almandine rim. The bouquet is intense, and rather rustic, with greenish balsamic accents and supported by considerable sea salt and some greenish peach fruit, and a fair amount of alcohol as well. On the palate it's ample, with fairly rich berry fruit supported by minerality more than acidity and by tannins that are fairly smooth, and flow into a peppery berry fruit finish with tannic underpinning. It's ample and soft, and lacking in brightness; there's more minerality than acidity, and this makes it seem settled, and while the peppery burr does provide life it really cannot substitute for acidity. Deep black almandine with black reflections and almandine rim. The bouquet is smoky, with mineral bitterness and a fair amount of cedar supported by hardwood ash and nose tingling acidity; there's not much fruit. On the palate it's ample, with fairly rich cherry fruit supported by deft berry fruit acidity and tannins that have a smoky cedar overlay and flow into a fairly long bright berry fruit finish with cedary underpinning. The nose is still unsettled, and though the palate is further along it too still has a ways to go; I would give it a year, and expect it to clean up nicely in an approachable international key. If you are more traditionally minded it won't work as well for you. Almandine with brownish black reflections and almandine rim. The bouquet is fairly bright, with cedar and some spice mingled with peppery accents and a fair amount of alcohol. Not much fruit. On the palate it's ample and more mineral than fruit driven, with leaf tobacco and some rosa canina supported by dusky bitterness and tannins that have a powerful tongue curling splintery burr and flow into a long tannic finish. It's woefully young in an ample fairly international key, and needs at least a year to get its bearings and come together. It's a wine you should only consider if you like the style; if you prefer brighter fruit and acidity it won't work for you. Deep almandine with black reflections and almandine rim. The bouquet is muted, though swishing brings up some berry fruit and slight spice. Not quite nobody home, but in that direction. On the palate it's full, with bright peppery fruit supported by sour berry fruit acidity and by peppery tannins that flow into a fairly long peppery finish. I'd have liked more brightness from the fruit and less aggressiveness from the tannins, though in their defense one can say that they're woefully young and unhappy. A score now will likely penalize the wine. Deep black almandine with black reflections and almandine rim. The bouquet is is fresh, with bright floral accents and deft berry fruit laced with hints of strawberries, and as it opens some greenish accents and hints of leaf tobacco, with some cedar and alcohol as well. On the palate it's bright, with fairly rich cherry strawberry fruit supported by deft berry fruit acidity and by tannins that are ample and smooth, and flow into a clean rather peppery berry fruit finish. Pleasant, in a ripe but not overripe key, and though it will benefit from another year's bottle aging it is already approachable now, and will work well with drier meats, or sweeter meat dishes along the lines of roast rabbit with prunes. This year Nebbiolo Prima began with the 2008 Roero, followed by the 2008 Barbaresco and the 2007 Barolo; there were also a few Barbaresco Riservas, and on the last day a number of 2005 Barolo Riserva wines. The afternoons were structured somewhat differently, with Monday afternoon dedicated to the 2001 vintage, a retrospective if you will, Tuesday and Thursday dedicated to winery visits and tastings. Wednesday free (and I did take advantage of that), and Friday there was an optional visit to Diano and Dogliani to taste Dolcetto di Diano and Dolcetto di Dogliani/Dogliani. A full week, but both pleasant and instructive and I learned quite a bit during the afternoon sessions, while the mornings were profitable as always. To begin, a couple of words on the vintages. 2008 : We tasted 2008 wines from Roero and the three Communes of Barbaresco, which, as the crow flies are quite close to each other. Very different wines, however. Roero continues to be the most uneven, in part because of the characteristics of the terroir, which is sandy and well drained, and yields -- if left to itself -- wines that are powerful, because Nebbiolo is, but revolve more around finesse and elegance within the Nebbiolo spectrum. And if the winemaker lets them be they can be quite nice. If, because some winemakers want something more substantial, and try to bulk them up either by going for concentration and complete polyphenolic ripeness, or through the use of new wood that Nebbiolo is really not that good at balancing. And when this happens, the wines feel bulky and forced. Barbaresco extends over a larger area on the opposite bank of the Tanaro river, and the 2008 vintage is not of as uniform quality as some other recent vintages have been. Though there were some exceptions, I found that in general the wines from the Communes of Barbaresco and Treiso showed significantly better than those from Neive, with nice fruit and bracing acidity in a variety of styles; as always, you'll have to match the wines to your tastes but there are many fine bottles to be had. Neive is instead more uneven. With Barolo we had the 2007 vintage, which is more approachable than the 2006 we tasted last year, with many of the wines richer, more opulent, and readier to drink. This said, as vintages go it's not as good as the 2006, and though the bottles will work better in the short term (3-5 years and perhaps a little longer) the 2006 has, I think, much better potential for long-term againg. This is not a bad thing; I ofund many wines that will be quite pleasant with foods (not as much in the way of meditation wines), and vintages that mature sooner are necessary, because they give us something to enjoy while we await the vintages that need time. A final practical point: I took a terrific volume of notes in the course of the five days of Nebbiolo Prima. To put everything up at once would be unthinkable, and putting up all of the Barolo notes together would be awkward. So I will be posting Roero and Barbaresco, and then Barolo by Comune, in the space of several posts. The wines are listed in the order they were poured, which within the Communes is by vineyard. Let's get started with the 2008 Roero! Pale brick almandine with black reflections. The bouquet is vinous, with cherry fruit supported by mentholated accents and some jammy notes, also slight gum Arabic. And spice. On the palate it's medium bodied, with bright mineral acidity and dusky graphite shaving bitterness, but not much fruit, and it flows into a fairly long bitter finish with sour mineral underpinning. It's rather austere, and though it will drink well with succulent meats that will benefit from its briskness. If you like the style you will enjoy it, but if you prefer more fruit driven wines it won't work as well for you. Deep black almandine with black reflections and almandine rim. The bouquet is moderately intense, with dusky bitterness and moderate fruit supported by some sour berry fruit acidity, while there is also some gunpowder to it. On the palate it's medium bodied, with lively sour berry fruit supported by brambly acidity and tannins that are rather splintery, and flow into a greenish splintery finish. It's quite young in a scrappy tannic key, and will drink well with fattier meats. Aggressive, and you have to like the style; if you prefer smoother softer wines it won't work as well for you. Dusky brick almandine with black reflections. The bouquet is moderately intense, with brambly accents and some underbrush, and also moderate alcohol. On the palate it's medium bodied, with moderately intense sour berry fruit, cherries with some currants, supported by dry brambly tannins that have a scrappy burr to them, and flow into a clean slightly greenish brambly finish with a bitter underpinning. Pleasant in a brambly scrappy key, and will work well with fattier roasts or stews; roast fresh (as opposed to cured) ham comes to mind. With the proper dish it will be perfect, but you have to like fairly aggressive wines with tongue-drying tannins. Deep black almandine with black reflections and almandine rim. The bouquet is fairly intense, with berry fruit mingled with quite a bit of cedar and some spice. Lots of oak. On the palate it's an oak concentrate, with moderate fruit that gives way to cedar that wells up and flows over the tongue; and flows into a long oak laced finish. It's like licking a barrel slat, and though the oak will fold in some with time, I doubt it will ever fold in completely. Something to consider only if you like heavily oaked wines. Deep black almandine with black reflections and almandine rim. The bouquet is brambly with quite a bit of oak as well, and some savory notes; not much fruit emerges. On the palate it's more nicely balanced than the nose suggests, though still revolving more around minerality and cedar than fruit; it's medium bodied with bitter minerality and some spice, and flows into a clean rather mineral finish. It's pleasant in an austere key, and will become rather ethereal with time, I think. With respect to some of the others it doesn't try as hard, and this is a good thing. Deep black almandine with black reflections and some orange in the rim. The bouquet is moderately intense with quite a bit of cedary oak and some savory notes, but not much fruit. On the palate it's further along, with savory minerality and some berry fruit supported by tannins that are quite dry and rather splintery, and flow into a clean savory finish. It's quite young, and needs another year to come together, but will be pleasant in a rather ethereal key with time, I think. Not a wine to drink tomorrow. Almandine with black reflections and almandine rim. The bouquet is a bit rustic, with balsamic accents and some wet stable straw mingled with slight gum Arabic and mineral acidity; as it opens sour berry fruit also emerges. On the palate it's fairly bright, with sour decidedly mineral berry fruit supported by tannins that have a distinct dusky bitter cedar and graphite shaving burr that's almost peppery, and flows into a fairly long rather bitter savory finish. It's bitter, and fairly aggressive, with tannins that are quite dry, but if you like the style displays pleasing grace, and will drink well with grilled or roasted red meats. But you have to like the style; if you prefer smoother softer more fruit forward wines it won't work as well for you. It will I think be fairly long-lived. Deep black almandine with black reflections and almandine in the rim. The bouquet is moderately intense, with cold coffee and coffee grounds, supported by bitterness and slight shellac, but not much fruit. On the palate it's medium bodied, with moderately intense sour berry fruit supported by cedar laced tannins and some brambly acidity that flow into a fairly long rather dry finis with a bitter cedary underpinning. It's pleasant but needs a couple of years to get its bearings, at which point it will drink well with grilled meats or roasts, and it will become more ethereal with time. Deep black cherry ruby with black reflections and almandine in the rim. The bouquet is younger than many, with some violets at first swish mingled with berry fruit, sea salt and some spice. On the palate it's medium bodied and rater bitter, with minerality and some sour berry fruit supported by tannins that are quite bitter and rather dry, with a cedary overlay to them that flows into a very savory dry cedary finish. The nose is more interesting than the palate in this phase, because the palate reveals a surfeit of oak; it may fold in with time, but time will tell. Deep almandine with black reflections and almandine rim. The nose isn't as clean as I might have liked; there's wet cloth and some bitterness and some spice, but not much fruit. On the palate it's bitter, and cedar laced, with again very little fruit, and it flows into a quite dry mentholated finish with considerable cedar. That continues at length, gradually revealing bitter spice. Deep black almandine with black reflections. The bouquet is one track, with a great deal of shellac and some underlying cedar. It's like sniffing a freshly soaked new barrel, after the water has been drained. The palate reflects the nose, with a great deal of cedar and some warmth, and peppery spice from the tannins, which flow into a warm peppery finish. The grapes are completely covered by the oak they went into. Deep black almandine with black reflections and almandine rim. The bouquet is fairly intense, with quite a bit of cedar that throws a blanket over most everything else; there is some spice too but the fruit is hidden. On the palate it's medium bodied, with moderate fruit supported by considerable tart warmth and cedary tannins that flow into a warm tannic finish. Very heavily oaked, and you have to like oak to like the wine. Deep black almandine with black reflections and almandine rim. The bouquet is savory with warmth and some cedar mingled with some shellac; a lot of wood that overshadows the fruit almost completely. On the palate it's savory, with fairly bright sour minerality and tannins that have a peppery burr and flow into a fairly bitter finish; the oak is present and does condition the wine, though not as completely as in some of the others in the flight; it will drink well with fattier meats and such, and will age well for a number of years, becoming more ethereal with time. But it is particular, and you have to like the style. Deep black almandine with black reflections and almandine rim. The bouquet is dusky, and rather rustic, with some stable straw mingled with spice; not much fruit. On the palate it's ample, with rather bitter berry fruit supported by dry spicy tannins that lay a peppery burr over the tongue and flow into a fairly long peppery finish. I'd have liked more fruit; the tannins end up stepping in to do duty, and aren't as interesting as fruit would have been. Almandine with black reflections and almandine rim. The bouquet is surprisingly fresh for a Riserva, with floral notes, violets in particular, supported by spice and some jammy berry fruit. On the palate it's medium bodied with fairly bright savory berry fruit supported by slight brambly berry fruit acidity and by tannins that are fairly bright, with a cedary burr that flows into a fairly long tannic finish. Pleasant, though it needs another year to come together, and will drink well with succulent grilled meats or hearty stews. Deep black almandine with black reflections and almandine rim. The bouquet is moderately intense, with sour berry fruit and some spicy bitterness, but not much in the way of fruit; there is however a fair amount of cedar to it. On the palate it's brighter than the nose suggests, with moderately intense very sour berry fruit supported by cedar laced tannins and minerality that flow into a clean rather bitter mineral finish. Pleasant, though it's not a wine to drink by the glass; it will instead work nicely with grilled or roasted red meats, especially more succulent cuts that will benefit from the tannins. Deep black almandine with black reflections and almandine in the rim. The bouquet is fairly intense, with moderate sour berry fruit supported by considerable cedar, and some wet coffee grounds, that are another manifestation of cedar, with some savory accents as well. On the palate it's medium bodied with fairly bright sour cherry fruit supported by savory mineral aciodity and by tannins that have a slight cedary burr, and flow into a clean sour cherry finish a dry tannic underpinning that has hints of cold coffee to it. Pleasant, in a young key, and will drink quite well now with grilled or roasted meats, and will also age nicely becoming ethereal and lacy with time. It grew upon me. Deep black almandine with black reflections and almandine rim. The bouquet is intense, with candied berry fruit supported by quite a bit of cedar, and some bitter cold coffee, with some spice too. On the palate it's moderately intense, with sour berry fruit supported by tannins that are rather splintery, and flow into a savory splintery tannic finish. It's fairly aggressive, and isn't a wine to drink by the glass, at least not now, though it will work well with succulent meats, and will age nicely too. Pale almandine with black reflections and almandine rim. It looks older than it is. The bouquet is moderately intense, with considerable brambles supported by some greenish accents and underlying savory berry fruit. On the palate it's graceful, with sour cherry fruit supported by brambly sour berry fruit acidity, and by tannins that are savory and rather splintery, flowing into a savory berry fruit finish. Graceful in a traditional key, and though it is beginning to show a degree of steeliness it's still quite young. I would give it time, because though it's pleasant now it will likely do interesting things. Black almandine with black reflections and almandine rim. The bouquet is intense, with quite a bit of cedar mingled in with shellac and hints, frankly, oak -- there's not much fruit, and it's like sniffing a wood shop. The palate reflects the nose; there's a lot of cedar, and considerable oaky bitterness, but not much fruit, and it flows into a bitter oaky finish. Too much oak, for me. Almandine with black reflections and almandine rim paling to orange. The bouquet is intense with an oddly eye-opening savory stable straw mix that a fellow taster describes as wet paint, with some savory notes as well. On the palate it's a bit brighter than the nose suggests, with savory berry fruit supported by tannins that have a cedary underpinning and flow int0 a dry tannic finish with underlying bitterness. It's not as clean as it might be on the nose, and this penalizes the palate, which I found more interesting. Deep black almandine with black reflections and almandine rim paling to orange. The bouquet is moderately intense, with jammy berry fruit supported by greenish brambly accents and spice with a fair amount of alcohol as well. On the palate it's medium bodied, and decidedly mineral more than fruit driven, with minerality and graphite shaving bitterness supported by warm peppery tannins that flow into a clean rather bitter finish. If you like the style, which revolves more around minerality than fruit you will enjoy it, and it will drink well with succulent red meats. But you have to like the style, which isn't for everyone. Deep black almandine with black reflections and almandine rim. The bouquet is intense, and greenish, with quite a bit of cedar but not much fruit. On the palate it's brighter than the nose suggests, and quite mineral, with moderate berry fruit, though what really emerges in addition to minerality is graphite shaving bitterness, while the tannins have a warm cedary burr and flow into a rather bitter cedar laced finish. I'd have liked more and richer fruit. Deep pigeon blood ruby with black reflections and almandine rim; it's considerably darker than most. The bouquet is different too, with jammy plum prune fruit supported by warmth and some balsamic notes, with hints of leather and horse (not lathered) too. On the palate it's ample and fairly smooth, with sour berry fruit that again has warm balsamic accents, and is supported by warmth and by splintery tannins that flow into a warm rather tannic finish. It's a bit more rustic than some, but not animal, and if you like the style you will enjoy it. But you have to like the style, and it does have the tannic tongue drying qualities many of the Roeri presented this year have displayed. Almandine with black reflections and almandine rim. The bouquet is moderately intense, with a degree of savory mustiness to it. On the palate it's savory, with considerable sour bitterness and tannins that are quite splintery, and flow into a bitter savory tannic finish. It's quite brash, and isn't a wine to drink by the glass in the near future, though its brashness will make it a good bet with fattier red meats, while its acidity and tannin will make it ageworthy, though I'm not sure how well it will do in the long run because there isn't as much richness of fruit as I might have liked. Almandine with black reflections and almandine rim; it looks older than it is. The bouquet is savory, with some sour berry fruit and slight mentholated accents with some bramble too. Pleasant in a rather restrained key. On the palate it's medium bodied, with moderately intense sour cherry fruit supported by savory minerality and some acidity, and by tannins that have a brambly underlie to them, and flow into a savory brambly finish. I'd have liked more richness to the fruit, which is not quite evanescent, but could have been brighter and fuller. Deep black almandine with black reflections and almandine rim. The bouquet is moderately intense, with dusky bitter minerality and some savory notes, but not much fruit. On the palate it's savory, with savory minerality more than fruit supported by dry brambly tannins that flow into a rather savory finish with a marked tannic burr that carries at length. It's quite young, and displays some depth, but I would have liked more fruit and less savory minerality. Black almandine with black reflections and almandine rim. The bouquet is fairly intense, with greenish minerality and spice supporting savory notes and some saddle leather. On the palate it's graceful, in a delicate key, with moderately rich berry fruit supported by deft acidity and smooth sweet tannins that flow into a clean slightly mentholated finish. Pleasant, and will drink nicely with grilled meats or light roasts, and will also age nicely for many years. Deep black cherry ruby with black reflections and cherry rim. The bouquet is moderately intense, with berry fruit supported by some bramble and delicate spice that has slight hints of menthol. On the palate it's rich, with elegant berry fruit supported by moderate acidity and by tannins that re rather splintery, and flow into a warm savory finish with slightly splintery tannic underpinning. It's quite young and needs another couple of years to come together, but should do so rather gracefully, and age nicely for many years. Almandine with black reflections and almandine rim. The bouquet is fairly rich, and greenish, with savory vegetal accents mingled with slight barnyard tang and balsamic acidity. On the palate it's fairly bright, with sour berry fruit supported by balsam-laced acidity and by tannins that have a rather coarse splintery burr, and flow into a fairly long savory decidedly tannic finish. It's a babe, and needs time to come together; the fruit has a fairly traditional feel to it, and it will I think be in that direction, though at present it is simply too young. Cherry ruby with black reflections and cherry rim. The bouquet is muted, though swishing brings up some berry fruit supported by slight greenish accents and hints of cedar; it's still coming together. On the palate it's pleasant, with elegant sour berry fruit supported by sour greenish berry fruit acidity and tannins that have a greenish overlay and flow into a long rather vegetal tannic finish. It's very young, but displays nice promise, and will drink well now with succulent grilled meats or roasts, while it also has the capacity to age nicely for many years, becoming lacy with time. Deep black almandine with black reflections and some almandine in the rim, paling to orange. The bouquet is muted, though swishing brings up some savory notes, and spice. It's really not ready. On the palate it's moderately intense, with sour cherry fruit supported by sour berry fruit acidity and by tannins that are rather brambly, and flow into a clean brambly finish with mentholated accents. It's promising, but rather like a toddler who finds herself on the runway of a fashion show for adults -- it needs another couple of years to begin to show what it has the capacity to be. I would give it time, because I think it could go places. Pale almandine with black reflections and almandine rim. The bouquet is fairly intense,with ith rosa canina and berry fruit supported by some cedar and pleasant floral accents; there's nice grace and dpeth in a young key. On the palate it's graceful, with delicate cherry and forest berry fruit supported by moderate acidity and by tannins that have a brambly burr and flow into a clean rather brambly finish. It's quite young, but shows well, and will become quite interesting in a fairly traditional key with time. It grew upon me. Almandine with black reflections and almandine rim. The bouquet is decidedly brambly with greenish accents and is supported by some red berry fruit, though what really emerges now is the bramble. On the palate it's bright, with brambly berry fruit supported by savory minerality and tannins that have a steely youthful splintery burr, and flow into a warm savory finish; it's quick to write but pleasant and graceful in a fairly traditional key, and will drink well with grilled meats or stews now, if you must, and will also age well for many years. If you prefer the more traditional style you will enjoy it, and even if you are a modernist at heart you will find things to think about. Fairly deep black almandine with black reflections and almandine rim. The bouquet is moderately intense, with some animal tang and some savory notes mingled with plum prune fruit and slight balsam, and also hints of sandalwood and menthol. Quite a bit going on. On the palate it's deft, with bright sour berry fruit supported by moderate berry fruit acidity and by tannins that are still quite young, and a little more blocky than they will be, but are beginning to display steel as well, and flow into a clean tannic berry fruit finish. It needs time, a couple of years at least, and will age well for a decade or more thereafter. Pleasant in a fairly traditional style. Pale almandine with black reflections and almandine rim. The bouquet is muted, though swishing brings up sour brambly berry fruit with slight greenish accents and hints of rosa canina. Quite nice, and it's one of those bouquets that invites repeated sniffs. On the palate it's graceful, with rich sour cherry fruit supported by sour berry fruit acidity, and by tannins that have a peppery burr and flow into a fairly long savory sour cherry finish with tannic underpinning. It's not a wine to be drunk by the glass now, but will work well with succulent red meats, and also has considerable aging potential; I would if I had a case age most of it because I think it will do interesting things with time. Deep pigeon blood ruby with black reflections and cherry rim. Darker than some. The bouquet is fairly rich, with cherry fruit that has some plum accents supported by spice and minerality that add nice depth, in a very young context. On the palate it's full, with moderately intense sour berry fruit supported more by tannins that have a blocky feel than by acidity, which I found somewhat lacking; the wine's not really settled, but doesn't have all of the verve I might have hoped for from the nose, and flows into a fairly bitter tannic finish. I'd have liked more acidity to keep it up. Deep black almandine with black reflections and almandine in the rim. The bouquet is fairly intense, with ripe fruit wrapped around cedar and some spice; the two are nicely balanced and the combination is harmonious. On the palate it's quite smooth, with fairly rich cherry plum fruit supported more by minerality than acidity, and by smooth sweet tannins that flow into a rather bitter mineral tannic finish that continues at length. I'd have liked a little more acidity, which has been smoothed out by the wood, whose tannins overshadow some on the palate. It needs time for the wood to fold in, and I would give it, though I did find the relative lack of acidity problematic. Deep black almandine with almandine reflections and white rim. The bouquet is powerful, with quite a bit of petroleum mingled with some barnyard tang and some airy spice; there's not much fruit. On the palate it's medium bodied to full, with moderate fruit supported by savory notes and acidity, and by tannins that are warm and splintery. It's quite young and still coming together, but I found myself wishing for more pronounced fruit and greater depth. Deep almandine with black reflections. The bouquet is fairly intense, with floral accents supported by berry fruit and a fair amount of cedar; it's nicely balanced and harmonious. On the palate it's a bit more aggressive than I expected, with moderate fruit supported by mineral acidity and tannins that are decidedly peppery and flow into a cedar laced peppery burr. I'd have liked greater richness of fruit, and somewhat less tannic angriness. Pale almandine with black reflections and almandine rim. The bouquet is moderately intense, with deft rosa canina mingled with bramble and some mentholated accents too, and also some sandalwood. Nice depth, and quite young too. On the palate it's full, with rich cherry fruit supported by bright sour cherry acidity and by tannins that have clean brambly accents and some greenish overtones, and flow into a fairly bright brambly tannic finish. It's quite young, but has nice potential, and will age well for a decade at least; if you prefer round smooth fruit driven wines it won't work as wlel for you, but if you like a more traditional style you will enjoy it. Deep almandine with black reflections and white rim. The bouquet is fairly intense, and rather vegetal, with greenish accents mingled with some spice; the fruit doesn't emerge much, surrendering to oak. On the palate it's dusky, with greenish accents and minerality supported by bitter notes, while there isn't much fruit, and it flows into a fairly long bitter finish. There's a lot of oak, and at present it overshadows the other components, especially the fruit, and though oak will fold in with time, it will always play a very significant role in the wine. Almandine with black reflections and almandine rim paling to white. The bouquet is fairly intense, and rather greenish, with vegetal accents mingled with spice and sour berry fruit acidity with fairly intense cedar as well. On the palate it's fairly bright, with sour berry fruit supported by some greenish berry fruit acidity and by tannins that have a fairly pronounced peppery cedar-laced burr, and flow into a long decidedly bitter peppery finish. It's fairly aggressive in its youth, and though I wouldn't drink it by the glass it will work well with fattier red meats off the grill or from the oven, and will age well for a number of years. To be frank the tannins need a couple of years to work into the wine; it's simply not ready yet. Deep almandine with black reflections and almandine rim with orange paling to white. The bouquet is fairly rich, with greenish berry fruit supported by berry fruit acidity and fairly intense alcohol, and by cedar and slight balsamic notes too. On the palate it's fairly rich, with bright bitter berry fruit supported by graphite shaving bitterness and tannins that have a peppery underlay and flow into a clean peppery finish that's fairly aggressive. It's very young, and needs time, at least a year, to get its bearings and come together; it is heavily oaked and if you like the style you will enjoy it, though if you prefer large wood, which has less of an impact, you may like it less. Deep black almandine with black reflections and almandine rim. The bouquet is intense, with elegant rosa canina mingled with some berry fruit and spice; it's fresh and graceful in a very young key, and invites a second sniff. On the palate it's fairly rich, with dusky berry fruit supported by savory minerality and dusky graphite bitterness that flows into a fairly long savory finish. It needs a couple of years, and is a wine that will work much better with rich succulent meats than by the glass; if you prefer smoother softe3r wines it won't work for you, but it will do a good job with the proper foods, and also has nice aging potential. Almandine with black reflections and almandine rim. The bouquet is a bit rustic, with wet horse supported by balsamic accents and some stable straw, and savory notes too. On the palate it's bright, with greenish berry fruit supported by moderate acidity and considerable graphite shaving bitterness that flows into a spicy tannic finish. It's young, and needs a couple of years to come together, and will also age well for a decade or more. Deep black almandine with black reflections and almandine rim. The bouquet is moderately intense, with greenish berry fruit supported by some cedar and slight brambly notes; it's very young and still coming together. On the palate it's bright, with lively sour cherry fruit supported by deft sour berry fruit acidity that has pleasing savory accent, and by tannins that have a warm savory burr and flow into a clean sour cherry finish with lasting warmth. Pleasant though woefully young, and will drink well with grilled meats or roasts in the short term, though it is quite age worthy. Black almandine with black reflections and orange in the rim. The bouquet is deft, with bright slightly greenish berry fruit supported by spice and brambly greenish acidity, and by a fair amount of alcohol too. On the palate it's bright, with sour cherry fruit supported by greenish berry fruit acidity, and by tannins that have a warm slightly greenish burr, and flow into a clean spicy tannic finish. It's bracing, and will drink well with succulent red meats in the short term, while it also has the capacity to age nicely for many years. Deep black almandine with black reflections and almandine rim paling to orange. The bouquet is fairly intense, with greenish vegetal accents supported by shellac and spice, but not much fruit. On the palate it's bright, though with more acidity and greenish spice than fruit, while the tannins are quite peppery and fairly aggressive and flow into a warm peppery finish. It's heavily oaked and the oak overshadows to a degree the fruit. Almandine with black reflections and almandine rim. The bouquet is intense, with rosa canina and deft floral accents mingled with some berry fruit and slight greenish accents that almost bring bell peppers to mind. Nice depth in a young key. On the palate it's pleasant, with considerable depth, with bright sour cherry fruit supported by berry fruit acidity and by tannins that are fairly smooth, displaying steel though a youthful burr, and flow into a clean rather bitter -- graphite shaving -- sour cherry finish. Graceful, in a fairly traditional key, and will drink very well in the short tem with succulent meats, but also age well for a decade at least. Almandine with black reflections and almandine rim. The bouquet is pleasant, with brambly accents and rosa canina mingled with some berry fruit and spice; it's slightly greener than some but displays considerable depth and elegance, and there are hints of leaf tobacco to it too. On the palate it's bright, with lively sour cherry fruit and acidity supported by smooth sweet tannins that are beginning to reveal steel -- no velvet yet -- and flow into a clean bright sour cherry finish. Quite pleasant in a traditional key, and if you like the style you will enjoy it very much. Deep black almandine with black reflections and cherry rim. The bouquet is fairly intense, with greenish vegetal accents supported by spice and alcohol, while there isn't much fruit. Spice and cedar, but not fruit. On the palate it's brighter than I expected, with fairly rich sour cherry fruit supported by mineral acidity and by tannins that have a fairly pronounced peppery burr and flow into a clean sour rather bitter peppery berry fruit finish. Its' a big, powerful wine, a well muscled athlete in a middle of the road key, and will drink well with roasts or stews in the near term, and also age well for at least a decade. It's not about subtlety, but not all wines are, and it has considerable pleasing power to it. Almandine with black reflections and almandine rim paling to white. The bouquet is fairly intense, with greenish bitterness mingled with spice and a fair amount of cedar too. On the palate it's full, and peppery, with fairly intense red berry fruit supported by bright sour berry fruit acidity and by tannins that have a lively peppery burr and flow into a clean peppery finish that continues at length. Quite vigorous, and will drink well with succulent roasts or stews. It will also age nicely. Deep black almandine with black reflections and almandine rim. The bouquet is fairly rich, with berry fruit supported by rosa canina and spice with some underlying cedar and a fair amount of alcohol as well; it's quite powerful and still quite young. On the palate it's powerful, with lively sour cherry fruit supported by mineral laced berry fruit acidity and by tannins that have some steel to them, and also considerable angry peppery graphite bitterness and flow into a bitter sour berry fruit finish with a fair amount of alcohol and tannic underpinning. It's well muscled, but lither, like a decathlete, and will drink very well with roasts or stews, though I would give it a few years because it will be more interesting then than it is now. Deep black almandine with black reflections and almandine rim paling to white. The bouquet is intense,with ith quite a bit of alcohol and fairly intense greenish accents supported by spice and some menthol. On the palate it's bright, with powerful sour cherry fruit supported by fairly brisk acidity and by tannins that are fairly rich, with slight hints of steel and a touch of peppery spice to them. Big, in a middle of the road key, and will work very well with grilled or roasted meats, though I would give it 3-5 years, and if I had more than one bottle age the second for longer. Deep almandine with black reflections and almandine in the rim. The bouquet is fairly rich, with sour cherry fruit supported by greenish vegetal accents and some berry fruit jam, also slight sweetness and a fair amount of cedar. Nicely balanced in a fairly bright key, and also a fair amount of alcohol. On the palate it's fairly rich, and direct, with bright berry fruit supported by moderate acidity and dusky tannins that have a peppery burr and pronounced graphite shaving bitterness that flows into a long bitter finish. It's up front and direct, and this is youth; with time it will gain in complexity and should be fairly long lived. Deep black almandine with black reflections and almandine in the rim. The bouquet is fairly intense, with moderate berry fruit and quite a bit of oak that presents as cedar, with peppery spice, and as the wine opens the cedar increases. On the palate it's a bit brighter than I expected, with lively sour cherry fruit supported by fairly bright acidity and tannins that have a strong cedary overlay and flow into a cedar-laced finish. There's lots of oak, but also lots of fruit, and the two balance fairly well, though at present the oak comes out in the end; this will change as the wine ages, and it will be pleasant in a slightly international key. If you like the style you will enjoy it, but do give it a couple of years to digest the wood. Deep black almandine with black reflections and almandine rim. The bouquet is fairly intense, with greenish accents and some sour berry fruit supported by considerable cedar and a fair amount of alcohol. On the palate it's fairly bright, with rich cherry fruit supported by moderate berry fruit and mineral acidity, and peppery tannins that have a cedary overlay to them and flow into a fairly long finish that gradually settles into cedar. It's middle of the road, and quite young; it needs a year or two to digest the oak it has eaten, at which point it will work quite nicely with roasts or stews, and also have the capacity to age nicely for a decade or more. Deep black almandine with black reflections and almandine in the rim. The bouquet is fairly intense, with considerable hardwood ash and cedar supported by sea salt and some menthol, and balsamic accents, and some underlying berry fruit that isn't really strong but does emerge. On the palate it's fairly rich, and more savory and mineral than fruit driven, with savory minerality and some sour berry fruit acidity supported by tannins that are warm and slightly splintery at this stage, and flow into a rather bitter mineral finish. I'd have liked greater richness to the fruit. Deep almandine with black reflections and almandine rim. The bouquet is moderately intense, with greenish accents that bring peach fuzz and almonds to mind, laced with red berry fruit and spice; it's very young and still coming together. On the palate it's bright, with lively cherry fruit supported by dusky bitterness and sour cherry acidity, and by tannins that are steely though very young, and flow into a clean fairly bitter finish. Quite pleasant in a fairly traditional key, and it is drinkable, but it has a long way to go before it reaches its peak. I'd give it 3-5 years at least, and if I had more bottles give some considerably more. Deep black cherry ruby with black reflections and slight almandine in the rim. Fiarly rich bouquet with berry fruit mingled with some hardwood ash and nose-tingling spice with slight hints of gum Arabic as well; as it opens the chemical accents take precedence over the fruit, and this is in part youth. On the palate it's fairly rich, with ripe jammy berry fruit supported by moderate acidity and by tannins that have a fairly intense cedar-laced peppery burr, and flow into a fairly long cedary finish. It's a bit heavily oaked, and quite ripe -- the fruit is jammy -- and once it has absorbed the oak will be fairly international in style; if you like riper fruit driven wines you will enjoy it. But give it a year at least to come together. Deep black almandine with black reflections and almandine rim. The bouquet is intense, and penetrating, with greenish cedar and some wood smoke mingled with some spice and warmth; there's not much fruit however. On the palate it's fairly intense, with sour cherry fruit supported by moderate sour berry fruit acidity and tannins that have a distinct cedary burr and flow into a fairly long rather bitter cedar laced finish. It's heavily oaked, and if you like wines that have a degree of oak you will enjoy it. If you like them less you will like it less. Deep black almandine with black reflections and almandine in the rim paling to orange. The bouquet is fairly intense, with cedar and vegetal notes mingled with some leaf tobacco and a fair amount of alcohol and some underlying pungency. Not much fruit, though there is some sourness, and as it opens some lacquer emerges. On the palate it's fairly rich, with moderate fruit supported more by minerality than acidity, and by tannins that hare smooth and do reveal an oaky component that carries through into a fairly spicy finish that does have some sour berry fruit accents. It made me think; it feels like it's in an unfortunate phase, and may come together in an interesting way, aging gracefully. I'm reserving judgment because it has promise that's not coming though. Deep black almandine with black reflections and almandine rim. The bouquet is fairly intense, and airy, with savory notes and sea salt supporting spice and oak, which overshadow fruit. On the palate it's fairly rich, with warm sour cherry fruit that is supported by moderate acidity and tannins that have a cedary burr and flow into a fairly long sweet cedar laced finish. It's quite young and needs time; at which point it will be fairly direct in a fairly international key. Deep almandine with black reflections and almandine rim. The bouquet is fairly intense, in a dusky spicy greenish key, and while there is much spice and a fair amount of alcohol there's not much fruit. On the palate it's ample, with moderately intense sour berry fruit supported by tannins that are powerfully oaked and very dry, flowing into a splintery dry finish with lasting bitterness. At present the fruit is completely overwhelmed, and while the oak will fold in some with time I wonder if it will ever fold in enough. Deep black almandine with black reflections and cherry rim. The bouquet is intense and quite ripe, with prune fruit supported by greenish cedar and some peppery spice; it gives an impression of considerable concentration and quite a bit of oak. On the palate it's full and powerful, with peppery spice and cedar more than fruit, while there isn't much acidity, and the tannins are decidedly oak-laced. It's heavily oaked, to the point that wood overshadows fruit, and though things may change in the future they also may not. Almandine with pale black reflections and almandine rim. One of the paler wines of the morning. The bouquet is elegant, with rosa canina and floral accents mingled with slight peach, red berry fruit, and some mentholated notes, and also underlying spice. Quite young but promising in a traditional key. On the palate it's bright, with fairly rich cherry fruit that has slight greenish accents and is supported by warm vegetal acidity -- something Nebbiolo can display -- and by smooth sweet tannins that have a hint of steel to them, and work more with finesse than raw power. Pleasant in a very young traditional key, and will also age well for many years. By comparison with most of the 2008 wines it's more graceful, and if you're traditionally minded you will like it. Fairly pale almandine with black reflections and almandine rim; it's paler than most of the wines poured today. The bouquet is in mid stride, with a fair amount of cedar and some greenish vegetal notes, and also some vegetal spice, but not much fruit. On the palate it's moderately intense with fairly generic sour berry fruit supported by mineral acidity and tannins that are firm, but not yet steely. I'd have liked a little more richness and brightness to the fruit, which is present but doesn't really lead. Deep black almandine with black reflections and almandine rim paling to white. The bouquet is fairly intense, with quite a bit of cedar, and some spice, but not much fruit; oak definitely predominates. On the palate it's ample, with minerality more than fruit supported by mineral acidity and tannins that have a great deal of cedar to them, and flow into a fairly long cedar laced finish with some bitter coffee grounds and cocoa; it's like licking a barrel slat dipped in wine. Too much oak for me. Almandine with brownish black reflections and orangeish highlights and rim. The bouquet is balsamic, with leaf tobacco and some ml mingled with slight greenish accents and some rosa canina, and some sweetness that adds depth. Very traditional. On the palate it's full, with delicate rose-laced sour berry fruit supported by sour berry fruit acidity that has some leathery accents, and by tannins that are warm and slightly splintery in youth, and flow into a clean bright leather and dried-leaf laced sour berry fruit finish with tannic underpinning. Quite pleasant in a very traditional style, and though one could drink it now it will improve considerably with time, and age nicely for at least a decade. If you are traditionally minded you will like it, and even if you're of more modern tastes you will find things to enjoy, especially as it ages. Almandine with black reflections and almandine rim. The bouquet is spicy, with unusual banana aromas that are I think wood-fruit interaction supported by peppery spice and some cedar. On the palate it's frankly generic, with moderate fruit supported by tannic minerality and peppery spice that carry though into a fairly long peppery finish. The fruit is overshadowed by wood, and I'm not sure it will ever emerge from this situation. Deep black almandine with black reflections and almandine rim. The bouquet is a bit funky, with barnyard tang mingled with yellow peach and some greenish accents; there's also slight musty dried orange peel, but not much fruit. On the palate it's fairly full, with minerality and spice more than fruit supported by tannins that have peppery accents and very faint gingersnap sweetness, and flow into a tannic finish. I'd have liked more fruit, which simply isn't there at present. It may emerge but then again it may not. Deep black almandine with black reflections and almandine rim. The bouquet is intense, and greenish, with quite a bit of cedar and some polished leather, with underlying penetrating acidity, but not much fruit. On the palate it's ample, with moderate generic fruit that's largely overshadowed by the tannins, which are distinctly oaky and lay a veneer over the tongue, while direction comes more from bitterness and minerality than acidity. It's lacking in fruit and brightness, forcing the tannins to come lead the way. Deep almandine with black reflections and almandine rim. The bouquet is intense and a bit unusual, with powerful sweaty redhead of the sort I associate more with Sauvignon supported by sea salt and some berry fruit, which takes second place to the sweat, while there is also some yellow peach, and as it opens the sweat shifts towards leather and leaf tobacco, while the peach gains in intensity and a fair amount of alcohol also emerges. It's like one of those people who doesn't pass unobserved. On the palate it's full, with cherry plum fruit supported by some cedar laced acidity and tannins that have a degree of oakyness to them, more savory than bitter, and flow into a long warm finish. It's a bit unusual, and if one were to ask me what it was away from Piemonte I'm not sure I would have guessed Barbaresco, at least not in this phase of its evolution; this said, it has a certain liveliness to it, and will drink well with succulent roasts or stews, and may also do interesting things as it ages. Deep black almandine with black reflections and almandine rim. The bouquet is moderately intense, with greenish cedar and some spice, and a fair amount of alcohol as well. Not much fruit. On the palate it's medium bodied and rather mineral, with minerality predominating over fruit, and spicy, peppery tannins that flow into a warm peppery finish. I'd have liked more fruit and brighter fruit driven acidity than it displays; what comes out is more oak and the oak and tannins carry the show. Lively black almandine with black reflections and almandine rim paling to white. The bouquet is moderately intense and somewhat funky, with cedar and slight barnyard tang supported by some spice, and some savory accents. Not much fruit. On the palate it's ample and bitter, with minerality and bitter graphite laced tannins that have a peppery burr, while there isn't much fruit to provide depth or interest. Almandine with black reflections and almandine rim paling to orange; by comparison with many of the Neive wines it's a bit paler and more garnet colored. The bouquet is fairly intense, in a mineral key, with some pungent accents and slight leaf tobacco, which gains in intensity as it opens, and there are also slight hints of sweetness too. Not quite rosa canina though I had the feeling it could be lurking off stage. On the palate it's not as bright as I had hoped; there is some sour berry fruit, and some berry fruit acidity, but the tannins are peppery and powerful enough that they take over, leading into a decidedly savory finish with some savory accents. Almandine with black reflections and almandine rim paling to orange. The bouquet is bitter, with moderate graphite shavings supported by savory accents and camphor-laced cedar with underlying spice; there's not much fruit. On the palate it's a bit brighter than I expected, with fairly rich sour cherry fruit supported by berry fruit acidity and by tannins that have a slight peppery burr and flow into a fairly dry tannic finish. It's in mid stride, but the fruit shows promise; I would give it 3-5 years because it may develop nicely, though there will always be an oaky component to it. Deep almandine with black reflections and almandine rim. The bouquet is moderately intense, with bright berry fruit supported by cedar and some floral accents; it's nicely balanced though very young, and needs time. On the palate it's fairly rich, with pleasant cherry fruit supported by moderate acidity and by tannins that have a warm cedar-laced burr, but complement rather than overshadow the wine, and carry into a fairly long rather bitter cedar laced finish. Pleasant, in a middle of the road key, and will also age nicely for many years. But do give it a couple to get its bearings before you open it. Deep black almandine with black reflections and almandine rim paling overtones orange. The bouquet is moderately intense, with greenish cedar accents and some spice, but not much fruit. On the palate it's full, with moderately rich cherry fruit supported by mineral acidity and by tannins that are fairly bright, and steely, and flow into a warm mineral finish with a fairly bright tannic underpinning that becomes savory as it fades. It's quite young, and working though the oak, but should clean up nicely in the space of a couple of years, and age well for a decade or more. Almandine with black reflections and almandine rim. Paler than many. The bouquet is a bit rustic, with balsamic notes and some stable straw mingled with wood smoke and sea salt, and some leather and leaf tobacco as well; there's not much fruit. On the palate it's fairly rich, with minerality more than fruit supported by tannins that have a peppery burr, and flow into a clean mineral finish with leaf tobacco laced tannins that gradually give way to savory bitterness. It's fairly traditional in style, but I might have liked a little more fruit. With time it may do interesting things. Deep black almandine with black reflections and almandine rim. The bouquet is spicy and greenish, with peppery pungency but not much fruit at all. Brambly greenness such one can almost see the thorns, but not fruit. On the palate it's a bit brighter than I expected, though still green, with spicy greenish accents and cedar more than fruit supported by some savory notes, and flowing into a warm tannic finish that's fairly long. Pale almandine with brownish-black reflections aln almandine rim paling to dusky orange. The bouquet is intense, with quite a bit of greenish cedar, and a fair amount of alcohol, but little in the way of fruit. On the palate it's brighter than the nose suggests, with moderately intense sour cherry fruit supported by sour berry fruit acidity and tannins that have a warm burr and flow into a warm sour berry fruit finish with savory underpinning. The nose is behind the palate and I would give the wine a year, perhaps two to develop; it should clean up nicely in a fairly traditional key. Almandine with black reflections and almandine rim. The bouquet is intense, with greenish red berry and plum fruit supported by spice and some penetrating acidity, with slight leaf tobacco as well. Quite young, but with pleasing depth. On the palate it's bright, with fairly rich sour cherry plum fruit supported by dusky greenish tannins and some sea salt laced mineral acidity, which flow into a clean slightly splintery tannic finish. It's very young and coming together, but promises nicely in a fairly traditional key, and may become graceful, in a rather ethereal way. Deep black almandine with black reflections and almandine rim. The bouquet is intense, with quite a bit of spicy cedar laced with some sweetness and supported by quite a bit of alcohol; it brings to mind old large wood. On the palate it's full, with spicy minerality more than fruit, supported by mineral acidity and tannins that have a warm peppery burr and flow into a fairly long tannic finish. Lots of oak, which overshadows the fruit. Deep black almandine with black reflections and almandine rim. The bouquet is greenish, with some vegetal accents and some spice mingled with spice and leaf tobacco. Not much fruit. On the palate it's fairly bright, with sour cherry fruit supported by sea salt and bright sour berry fruit acidity, and by tannins that are fairly smooth and flow into a tart berry fruit finish. The palate is more along than the nose, and displays fruit that has pleasant acidity; I would give it at least a year for the nose to develop, and then drink it with a steak. Deep black almandine with black reflections. The bouquet is powerful, with quite a bit of oak that presents as cedar in spades, and some underlying bitterness. On the palate it's ample, with more fruit than I would have expected from the nose, sour cherry with some berry fruit acidity, which is overcome in the finish by tannins that have a decidedly cedary overlay and flow into considerable slightly savory cedar in the finish. The fruit is enough to emerge from under the oak ate the outset, but then fades if it succeeds in digesting the oak with time it will be fairly bright in a very international key, it does show some promise, but needs time. Deep almandine with black reflections and almandine rim. The bouquet is penetrating, with some greenish accents and spice, and oak supported by a fair amount of alcohol. On the palate it's ample, with minerality and tannic spice more than fruit, and it flows into a tannic peppery finish. I'd have liked more fruit and more acidity. Fairly deep almandine ruby with black reflections and almandine rim. The bouquet is fairly intense, with greenish accents and spice mingled with some berry fruit and slight jammy sweetness, while as it opens cedar also emerges. Quite young in a fairly international key. On the palate it's full, with peppery plum cherry fruit supported by minerality more than acidity, and by tannins that are smooth and have a cedary underpinning, and flow into a fairly quick bitter savory berry fruit finish with tannic underpinning. It's fairly international in style and in mid stride; it needs another year to get its bearings, and is worth waiting for because the fruit is there. I would expect it to age well for 8-10 years at least. Deep black almandine with black reflections and almandine rim. The bouquet is vegetal with penetrating greenish accents and spice, and some sea salt as well; as it opens there are also slight jammy plum accents and a fair amount of warmth. On the palate it's fairly rich, with berry fruit supported by considerable peppery spice and tannins that extend a peppery purr over the wine, flowing into a decidedly tannic finish that's quite dry. Too much oak, especially on the palate. And I fear that the fruit will likely never manage to overcome it. Deep black almandine with black reflections and almandine rim. The bouquet is unusual, with meaty aromas that bring to mind the sort of salty sugo alla Bolognese one gets as a cheap eatery, and as it opens French onion soup also enters the mix. A first for me. On the palate it's savory, to the point of bringing bouillon to mind, with berry fruit supported by peppery tannins; it's by far the saltiest wine poured today, and flows into a warm rather savory finish. It's absolutely atypical, but does have a certain verve to it, and will work well with a succulent steak or fatty roast, along the lines of leg of lamb. It also has the feel of something that is still coming together, and I am not sure a score now will reflect the future. Black almandine with black reflections and almandine rim. The bouquet is oaky, with cedar and dusky shadow mingled with some spice, but not much fruit. On the palate it's full, with minerality more than fruit driving the show, and a fair amount of peppery spice as well that draws into a peppery finish. I'd have liked more and brighter fruit and acidity; both give way to oak, which carries the show, doing the best that it can, but fruit is more interesting. Deep black almandine with black reflections and almandine rim. The bouquet is rather funky, with pungent barnyard tang -- wet stable straw -- mingled with some spice and savory accents. Not much fruit. On the palate it's a bit brighter than one might have expected, with savory accents and some berry fruit acidity supported by tannins that are peppery and flow into a fairly long peppery finish. Wines that are funky in this way on the nose often have brighter balsamic fruit, but this isn't the case here. Deep black almandine with black reflections and almandine rim. The bouquet is bright, with ripe cherry plum fruit supported by jammy accents and some violets; it has an opulent freshness, and is quite different from the majority of the wines poured. On the palate it's quite ripe, with ample cherry plum fruit supported by moderate mineral acidity and by smooth sweet tannins that flow into a fairly quick dusky finish that reveals some plum. It's softer and more international in key, and would be pleasant, though I found it a bit short -- it fades faster than I might have liked, and this is a pity. Deep black almandine with black reflections. The bouquet is powerful, with intense greenish cedar and slight peach fuzz. A lot of oak, which overshadows the grapes. On the palate it's bitter, with fruit that immediately surrenders to cedar that carries into a cedar laced finish; it's like licking a barrel slat dipped in wine, and though the oak will fold in some with time I doubt it will ever fold in completely enough to allow the fruit to emerge. Deep black almandine with black reflections and almandine rim. The bouquet is pungent, and balsamic with a fair amount of oak as well. Heat and not much fruit. On the palate it's a bit brighter than the sìnose suggests, with warm sour berry fruit supported by berry fruit acidity and by tannins that have warm balsamic cedar accents and flow into a warm slightly candied fruit finish with tannic underpinning. It's not defective, but is strange. Deep black cherry ruby with black reflections and cherry rim. The bouquet is rich, with vegetal accents and greenish notes mingled with some berry fruit spice and slight jammy notes. On the palate it's ample, with berry fruit supported more by peppery tannins than by acidity, and it flows into an angry peppery finish. I'd have liked more depth and richness to the fruit than I found. Almandine with brownish black reflections and almandine rim; it's among the paler wines of the day. The bouquet is a bit rustic, with balsamic notes mingled with stable straw and some spice, and supported by sour berry fruit acidity. On the palate it's bright, with lively sour cherry fruit supported by pleasant sour berry fruit acidity, and by tannins that are smooth, and sweet, and have slight velvety accents, while the finish, which is long and has sour berry fruit accents, also displays some of the balsam that was present on the nose, and flows into lasting warmth. Quite pleasant in a decidedly old style key, and will drink very well with grilled meats or roasts now, and also has the wherewithal to age well for many years. If you're a modernist it won't work as well for you, but if you're traditionally minded you will enjoy it. Deep black almandine with black reflections and almandine rim. The bouquet is a bit musty, with wet cardboard mingled with spice and greenish accents. On the palate it's full, with generic mineral laced fruit supported more by minerality than acidity, and by tannins that are a bit splintery, and flow into a peppery tannic finish. Pale almandine with brownish black reflections and almandine rim. The bouquet is intense, with chalk and some greenish accents supporting spice and minerality more than fruit, with some rather penetrating cedar as well. On the palate it's a bit sweeter than I expected, with plum cherry fruit supported by minerality more than fruit driven acidity, and by smooth sweet tannins that have a slight cedary burr and flow into a fairly long plum laced finish. It's riper than many of the wines, and the palate is ahead of the nose, which is still sorting through its issues. I'd give it a year at least to get its bearings, and think about it if I preferred riper as opposed to more aggressive wines; I think it will clean up nicely in a fairly international key. Almandine with black reflections and almandine in the rim. The bouquet is fairly rich, with balsamic accents mingled with some berry fruit and to a greater degree gum Arabic, and also some spice. On the palate it's ample, with rather dusky berry fruit supported more by minerality and balsamic tannins than acidity, and flows into a rather savory bitter tannic finish. I'd have liked brighter fruit, because what there is is rather settled, and will I fear continue to settle with time. Deep black almandine with black reflections and almandine rim. The bouquet is fairly bright, in a vegetal key with a fair amount of cedar as well, and some hardwood ash. On the palate it's ample, with berry fruit that's a little richer than I expected supported by moderate acidity and tannins that have an angry cedar laced burr and flow into a decidedly tannic finish. It's heavily oaked, too heavily for me, though the fruit is pleasant. I don't know how well it will do in absorbing the oak, however. Almandine with brownish black reflections and orange rim. The bouquet is rustic, with warm balsamic acidity supporting some green leather and slight stable straw, with underlying barnyard tang. Pleasant, but you have to like the style. On the palate it's bright, with fairly rich sour cherry fruit supported by sour berry fruit acidity and by tannins that have warm balsamic notes and some sweetness to them, and flow into a fairly long balsam-laced finish. Quite old style, with rustic overtones, and if you like this you will enjoy it very much. If you prefer a more modern style it won't work as well for you. Deep almandine with black reflections and almandine rim. The bouquet is fairly intense, with berry fruit supported by greenish cedary pungency and some cedar laced spice. On the palate it's fairly rich, and a bit riper than I expected from the nose, though the tannins are angry and peppery, and flow into a decidedly spicy finish. It needs time, at least a year, and I would give it because there is some acidity that will give the wine the time it needs. A score now will not reflect the future. Deep black almandine with black reflections and almandine rim paling to orange. The bouquet is fairly intense, with greenish peppery spice that has some balsamic overtones and quite a bit of wood smoke. On the palate it's full, with fairly rich slightly greenish berry fruit supported by sour mineral acidity and peppery tannins that do have some oaky accents to them, and flow into a clean peppery tannic finish. It's fairly international in key and quite young; it needs at least a year to come together and two would be better; it will drink well with grilled meats or roasts, and will also age nicely for at least a decade thereafter. It should develop nicely in a fairly muscular middle of the road key. Deep black almandine with black reflections and almandine rim. The bouquet is fairly intense, and rather green, with a fair amount of spice and some green leather as well. Not much fruit. On the palate it's brighter than I expected, with sour cherry fruit supported by tannins that are peppery, and by sour berry fruit acidity that flow into a fairly long peppery finish. It's fairly aggressive, but this is also youth, and will drink well with roasts or stews in the mid term, though I would give it a year overtones get its bearings and come together. Pale almandine with brownish black reflections and almandine rim. The bouquet is fairly rich, with berry fruit laced with leaf tobacco and some leather, and some warmth as well. On the palate it's bright, with lively sour cherry fruit supported by bright sour berry fruit acidity and by tannins that have a warm peppery burr, and flow into a clean fairly rich sour berry fruit finish. It's quite young, but displays pleasing vigor in a middle of the road key and will work well now with grilled meats or hearty roasts, and also has the wherewithal to age well for many years. Almandine with black reflections and almandine rim. The bouquet is fairly intense, with quite a bit of cedar mingled with some greenish accents, leather and some leaf tobacco, while there is also alcohol, but not much in the way of fruit. Smoky pungency, rather. On the palate it's full, with bright sour berry fruit supported by graphite shaving bitterness and tannins that have a youthful peppery burr and flow into a clean peppery finish that's fairly young. It's a very young wine, but displays sufficient fruit to hold while the tannins smooth, and should clean up nicely in a middle of the road key, and age nicely for a decade or more. Deep black almandine with black reflections and almandine rim paling to orange. The bouquet is fairly intense, with savory balsamic accents and some hardwood ash supported by slight peppery spice and some greenish leaf tobacco; there's not that much fruit, though -- more tobacco and spice. On the palate it's bright, with fairly rich sour cherry fruit supported by deft sour cherry acidity, and by tannins that are smooth though they do have some peppery spice to them, and flow into a clean sour berry fruit finish with peppery underpinning. Pleasant in a very young muscular key, and will drink well with roasts or stews now, though it also has the legs to age nicely for 10-15 years. Black almandine with black reflections and almandine rim; it's paler than many of the wines poured today. The bouquet is fairly intense, and quite young, with red berry fruit supported by berry fruit spice and some alcohol, and by some herbal accents that are quite typical of Nebbiolo. On the palate it's bright, with fairly rich cherry fruit supported by sour cherry acidity and by tannins that are somewhat splintery, and flow into a fairly long tannic finish that gradually dries, revealing some youthful cedar. It needs at least a year and two would be better, and but is pleasant in a muscular middle of the road key, and though I would give it a year at least to come together, could work now with a steak or roast. Expect it to age well for at least a decade. Deep black almandine with black reflections and almandine rim. The bouquet is penetrating, with quite a bit of cedar and some spice mingled with some pungency. Not much fruit. On the palate it's ample and frankly oaky, with minerality and oak more than fruit, and some underlying sweetness that is likely alcohol-related, flowing into a rather sweet tannic finish with cedary underpinning. Too much oak for me. Almandine with brownish black reflections; it's one of the paler wines. The bouquet is not rustic, but old style, with leather and some leaf tobacco supported by savory accents and a certain animal pungency mingled with sea salt. On the palate it's fairly bright, with warm savory berry fruit supported by sour berry fruit acidity that does have some acute notes, and a slight balsamic sweetness, and tannins that are peppery and flow into a warm peppery finish that is quite tart, and penetrating, and continues at length. It's a sleeper; from the nose one wouldn't expect the aggressiveness that emerges in the finish on the palate. Because of it, the wine will work better with succulent red meats or stews and isn't something to drink by itself. It will, I think age well for a decade or more, and may become ethereal with time. Lively almandine ruby with some cherry reflections and slight almandine in the rim; it's a bit brighter and more towards ruby than some. The bouquet is fairly intense, with savory balsamic acidity laced with wet horse and some spice. Quite young. On the palate it's fairly rich, with bright sour cherry fruit supported by moderately intense berry fruit acidity and tannins that are rather blocky in youth, but display hints of velvet and should smooth nicely with time. I would give it a couple of years, and expect it to age well for a decade at least thereafter. Almandine with brownish black reflections and almandine rim. The bouquet is fairly rustic, with balsamic notes and some lathered horse supported by slight wet stable straw. There's something sunny to it. On the palate it's bright, with fairly rich balsam-laced berry fruit supported by greenish accents and fairly bright balsamic acidity, while the tannins have a slight cedar underpinning (new large wood?) and lasting warmth, and flow into a fairly long balsam-laced finish with some graphite shaving bitterness. Pleasant in a fairly traditional key; it needs another couple of years to get its bearings, and will age well for at least a decade thereafter.